Christmas is normally my favorite holiday; and a time of year when I shift into automatic gear. This year, automatic gear did not work. For the previous ten to twelve years, this time of year meant a trip north, for Thanksgiving, with stops along the way, which almost always included a visit to Washington D.C. and some historical place that I wanted to see. I would also do most of my Christmas shopping, on that trip. Before hitting the road, I would put the Christmas Village up, which is normally a three to five day affair and, puts me in a splendid mood, as I unpack and position the pieces which not only represent the first Christmas Kate and I spent together, http://thatisallfornow.com/?p=5465, but all of the additions from both my travels and collecting, to gifts from family and friends. http://thatisallfornow.com/?p=2152. 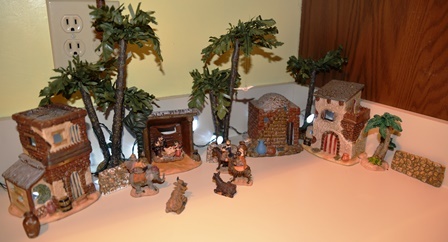 This year, The Village was put up in the Library, on a new table; there are quite a few new elements, which needed to be accommodated. It has grown so much, and taken on such a different feel. As I put the finishing touches on it, I realized that my Mother never gave me anything for The Village, for a second, I found it odd. Then I remembered that she did give me the village of Bethlehem – four buildings the same size as my original Village, three kings, livestock, and of course Mary, Joseph, and Jesus. Mother always stood out. It had been such a wonderful surprise, my Bethlehem; I kept it in the kitchen, on the window sill between the sink and the Florida room, where I spent time with it daily. I have set it up in the new kitchen, but the window sill here is too small, so Bethlehem sits on the counter. I have to find it a better home. When we would get back, from the trip north, we would go out and buy a Christmas tree, often that very same day. Kate would trim the extra branches off, before she positioned it in the house, waited a day for the leaves to fall and then lit it, which meant it is time for me to begin to decorate it, while she headed outside to put up the Nativity, Santa, and lights galore! We would then make plans to see a Christmas show, whether The Nutcracker or The Messiah or A Christmas Carol, usually an evening shared with friends, make sure to drive through the holiday light show, in Trade Winds Park, go to the Boat Parade, get ready for Christmas Eve Dinner, and our open house. But this year is different. The last time I put up all of the regalia, which symbolizes this time of year, I was in Florida, with my Mother and my Merry. Those of you who regularly read these pages will know that my Mother passed away on New Year’s Eve, last year. This is the first Christmas, in my life that I will celebrate without her and I scarcely know what that means. There were only a handful of Christmas’ that I did not celebrate with my Mother even if we were not physically together, we always exchanged Christmas cards, several cards, we both liked mail, and she was one of my favorite people to shop for, as she was always thrilled to receive anything I gave her. I loved ordering surprises for Mother, as she loved receiving them. I miss her more than I can ever adequately express. I also miss my dear dog, Merry, whom I loved for 16 years, and lost in March, of this year. Repeatedly, we have been told to acquire a new dog, which may happen one day, but for the moment, I cannot imagine how I could ever have another dog. Merry was delightful in every way and her loss is also overwhelming. Kate and I debated, before the stockings came out, what we would do with Mother’s and Merry’s stockings, in the end, I put them both up. I do not know why. I said it is because the stocking hangers spell NOEL, and that none of our stockings have our names on them, and because I made all of the stockings – well all of them except Merry’s, which Joan Hayden found at a yard sale; but the truth is that it just does not feel right, to not have Mother and Merry’s stockings up. This is supposed to be a time of joy and happiness, yet for so many people, the holidays remind us of our losses – the people who are no longer there, the dreams that did not become reality, the changes which have been forced upon us, the financial burden of trying to share cheer, the broken bodies and spirits which seem not to mend, the pain we have caused to those we loved, and the loss of hope, which can overwhelm us in the midst of the happy shoppers – none of this should be so. However, there must be joy in the sorrow if we are to go forward. My Christmas joy came in the form of a photograph, of my Mother. Below, is the printout from eBay, no less, which Kate purchased for me – yes, this is my favorite Christmas gift! 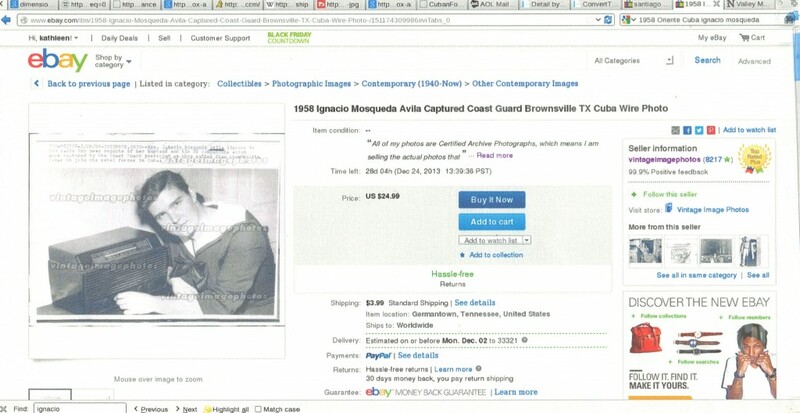 I cannot believe that my Father’s name and my Mother’s face were for sale on eBay. It is the original print from the Associated Press, which chronicles a piece of their history and my own. I am more than touched by this gift. My Mother would have gotten quite a kick out of knowing her picture was for sale, just like I did. Next week, we will mark the one year anniversary of her passing; but forever we will celebrate her life. That is all for now. This entry was posted on December 27, 2013 at 4:48 pm and is filed under From the Editor, Holiday's, LeftSide. You can follow any responses to this entry through the RSS 2.0 feed.